A new publication is out! Together with Anna-Lisa Müller I published an article based on our book about Architecture and STS. Click here to learn more about our understanding of the notion of Locality! New publication! It's about the "Interactional Foundations of Economic Forecasting" in a volume edited by Jens Beckert and Richard Bronk! My new book presenting a sociology of scientific econimmc forecasting in Germany is now available! I always knew it: beer has "mood-elevating effects"! Read the new paper by Sommer(!) et al. about how the D2 receptor and hordenine co-operate. Cheers! New publication! Read my new article about the shortcomings of the current use of the notion of Open Science here. Out now! A first conceptual article about what we may call a Synthetic Society. More will follow! "Article I All human beings are born free and equal in dignity and rights. They are endowed with reason and conscience and should act towards one another in a spirit of brotherhood." Today I received my Habilitation. I am a PD now. I published a new article on quantitative methods in the history of sociology! In 2013 i wrote a first article about the history of the Österreichische Zeitschrift für Soziologie and now a second one was published - with updated quantitative and new qualitative data. Great! Proud to be part of another great event together with many researchers working on forecasting in economics and the economy. Organized by the MPIfG and held in Paris, oui Paris. Great News! The book I co-edited with Anna-Lisa Müller on the sociality of architecture and materiality is out now! Buy it here! The publisher Elsevier has anounced that the second edition of the Internaitonal Encyclopedia for the Social and Behavioral Sciences is released now. Click here to read a blog post by the editor-in-chief James Wright about the the internationality of this monumental book project. And don't forget to read the 2 articles I have written for it! Very interesting! Empirical data about the social closure in German universities. (see also the full article. I do not agree with Linus opinion about socks and sandals but I will fight for his right to make his point. +++ Breaking News +++ The sociologial experiment I am working on these weeks is in the (local) news (pdf) +++ Breaking News +++. In July this year I start with a row of sociologial experiments to analyze the synthetic situation. We managed to gain support from several institutions to realize this very unusual sociological project: Thanks to SPP "Mediatisierte Welten", creativetechnologies.de, Historisches Museum Bielefeld, the University of Konstanz, and the Deutsche Forschungsgemeinschaft! Please Support Michael Köhlmeier in his engagment against Austrian racist neonazis. And buy Michaels books! Preferably in a bookstore in your city. Hahahaha. I just can laugh about the 10th birthday of F*ceb**k. My website may be oldschool and red but it is already 13 years old. In your face, Mr. Zuckerberg. Reichmann, Werner. 2013. "Epistemic participation - how to produce knowledge about the economic future". Social Studies of Science 43(6):852-877. Younger STS-scholars! Go to Bielefeld on Oct 12&13 and join the INSIST Kick-Off Meeting! The "Single Market Scoreboard" reports the development of the EU's single market. The DLF-"Chanson of the Month" (May 2013) is the first acceptable media comment to the German debate about tax evasion. If you are a not an English native-speaker and need someone who corrects your english texts, I really recommend Anne and her new company: www.write-english.de. The Independent says that "Amazon 'used neo-Nazi guards to keep immigrant workforce under control' in Germany". Finally, the Krümelmonster returned the cookie. Thank you..
A piece of Philosophy of Science. The evaluation of my course on "Advanced Philosophy of Science" is online. Just click on teaching and enjoy. Germany: 2% of all academic scholars, who are not full professors, have an open-ended contract. 53% of the contracts run for less than 12 months. 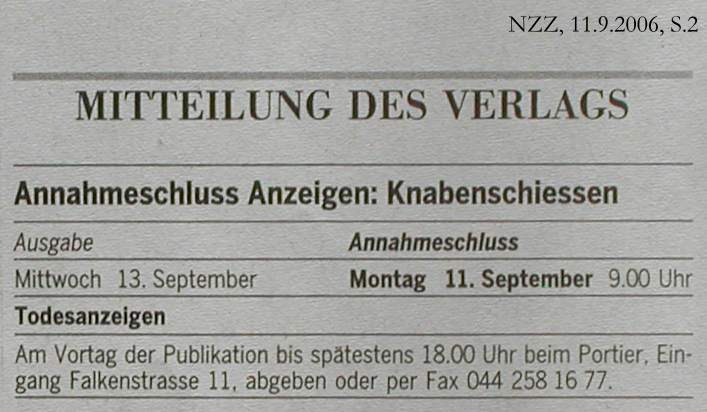 (nds - Zeitschrift der Bildungsgewerkschaft, 9-2012, p.28). About the relationship between Austria and Germany. No more plastic bags in L.A. Why not do the same in Germany? How can I understand Russia's rank in this chart? Christian Y. Schmid, former member of TITANIC, about Ai Wei Wei. 20 Years ago Linus Torvalds published the first version of a operating system. Today we call it Linux, it drives 90% of all webservers, and makes my life easier every day. Thank you. Here is Linus' first post in a newsgroup. This is a (well, more or less) interactive map telling the history of famous brands. Interesting! What the hell are Linux-holidays? Find 'em here! Here are some hints for journalists! For those of you who live in or around Köln/Cologne this may be interesting. Today is International Holocaust Remembrence Day. What are presidents from the German-speaking countries doing on such a day? German's president Wulff is in Ausschwitz to remember and to keep silent. Austria's president is in Burgenland to open "Lisztomania" and smiles to every camera. I'm so ashamed. I prefer to live in an enlightened political system. What do you think why teens drink alcohol? Because everyone else does it too. Cheers. I hope I will never find a photo of myself in this blog. My great statistics of suicides and traffic accidents is still available. The latest course evaluation is online. This year someone won the Eurovision Song Contest. Here is the Hymn: download. Now the way is clear for the big triumph of the Austrian soccer team at the World Championship. "The Economist" tries to re-arrange Europa - and goes an innovative way. I've been invited to hold a lecture about forecasting and "Doing Future" at EXPLORATIONEN Symposium" on June 11th, 2010. Am 20.4.2010 und am 27.4.2010 entfaellt die Sprechstunde. Here you can find voices out of the centre of the econoimic crisis. The new evaluation of my courses this term are now online. Click on "teaching" and "enjoy". 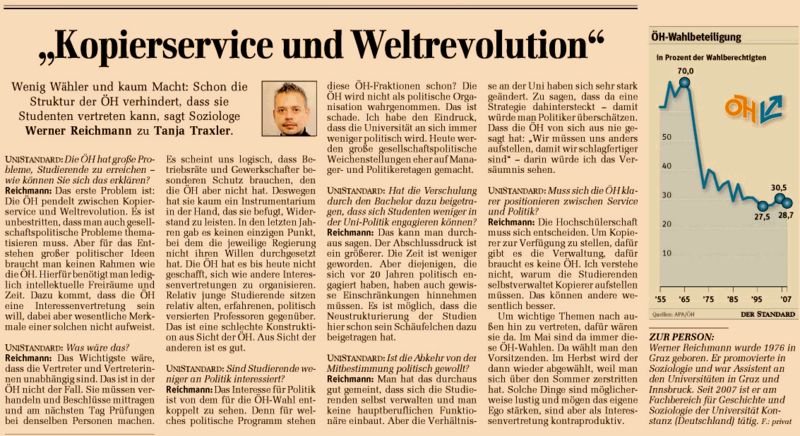 There's a discussion about the relationship between science and the public at raumnachrichten.de. Feel free to participate! I made a public photo-album @ picasa. It's a (more or less) sociological collection of photos caught in the web. Mr. Diekmann, you've got mail. The new "Gender Gap Report 2009" is out now! Paraguay is the biggest winner (2008:100, 2009:64), Tanzania the biggest loser (2008:38, 2009:71), and Yemen (again) lost the race. @all students in the "Prognose"-course: the syllabus is now online. You should read more poetry! I never thought that Niklas Luhmann could be this funny. In Germany some PhD-Candidates paid for their academic title. Quiz: What happend to the last undemocratic Bundeswahlleiter? Click here for the answer!. 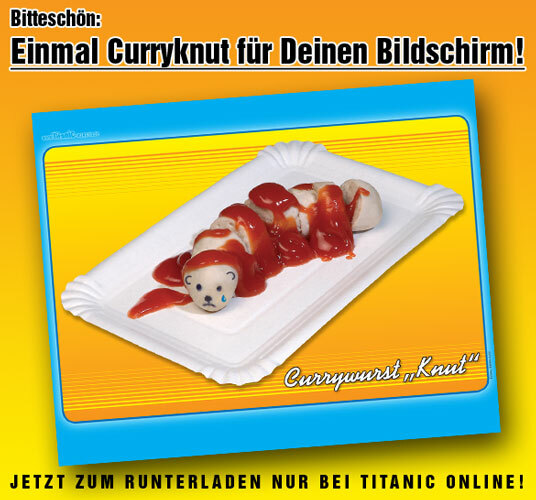 They use Baudrillard to explain Die PARTEI. I prefer the "political" interpretation. Here's a very good text about experiencing Europe. SOCIOLOGY: What happens if a real sociologist meets a real queen? Homo Meritocratus: "To actually see if there was any validity to the afore-mentioned article" (Nature 452, p.674) some of us use some little helpers. LINK OF THE WEEK : Gerd Kaup's wonderful ranking of the greatest entries in "Wikipedia". Today: Heinz Conrads! WORLDNEWS : Russia's prime-minister V. Putin apologizes for killing a tiger! A speaker of the friendly dictator reported that Putin targeted at a TV-journalist when suddenly the tiger jumped into the scence. Have a good time in Yale Stefan Beljean! Normally I don't laugh about this guy (he seems to be too dangerous) but these photos are good. The heart of every public sociologist increases beating when investigating the possibilities of social networtk analysis. You'll find a very good example here. Here's a website "honoring those who improve the species...by accidentally removing themselves from it!'" Hehe. Marvelous! Those who are interested in the possibilities of Social Network Analysis should click here. You can now subscribe to this webpage via rss 2.0. Here is a wonderful article about Austrians' "Weltklasse-Uni"?!?!?! Congratulations to the computer hacker. A fantastic strategy to protect yourself against the dangerous consequences of sitting too long in the blazing sun. We have to rethink ... reality. Harald Schmidt meets Helge Schneider. Why are we Morrissey fans? Because we must. Super Link #7: Click here to learn how to cope with frustration and here to find the book Toni Mahoni speaks about. I think britsh cars don't like cats. 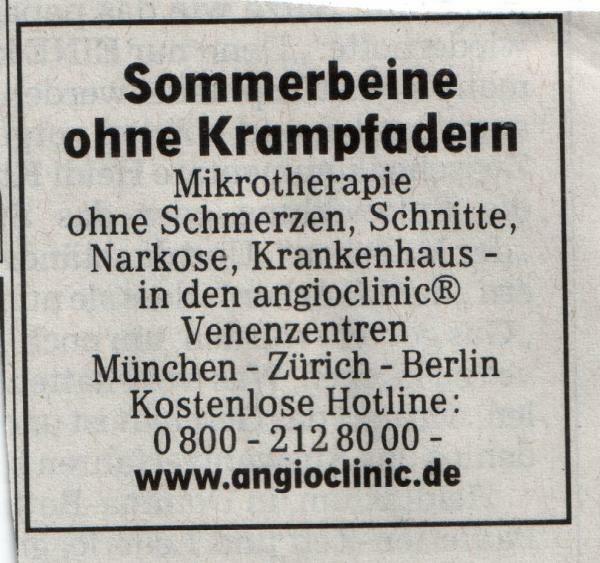 I hope this service will come to Austria soon. Who can remember Osvaldo Cavandolis screaming and laughing "la linea"-man ?!? Watch the trailer of the new film of Borat! Heeeee!!! My courses are NOT so easy to pass. What you should consider when reading scientific articles. Super Link #1: How to grab quantitative tables from pdf-documents? Here is a great tool with a free offer for scholarly use.